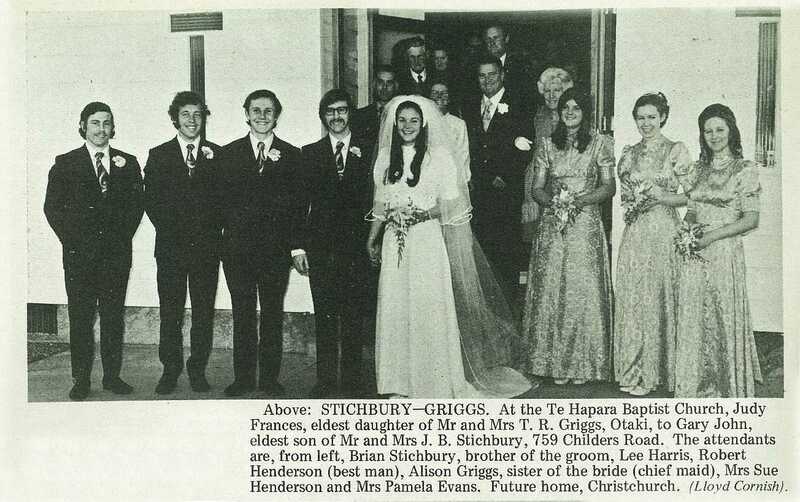 Stichbury–Griggs. 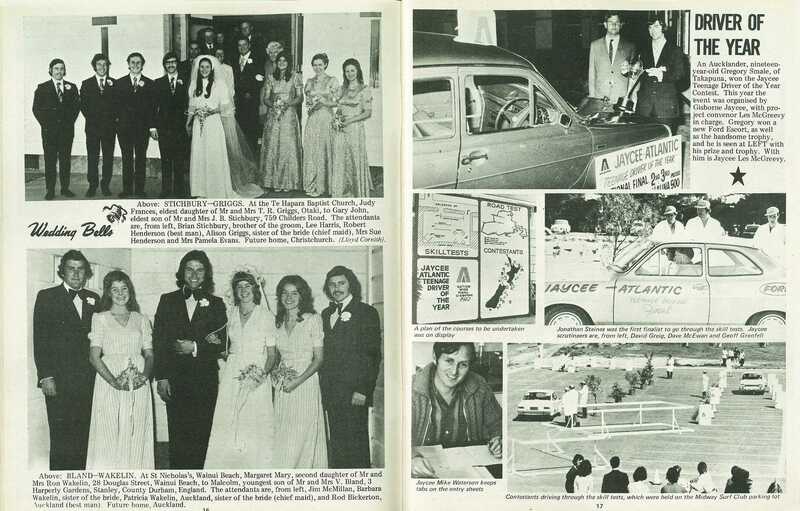 At the Te Hapara Baptist Church, Judy Frances, eldest daughter of Mr and Mrs T. R. Griggs, Otaki, to Gary John, eldest son of Mr and Mrs J. B. Stichbury, 759 Childers Road. The attendants are, from left, Brian Stichbury, brother of the groom, Lee Harris, Robert Henderson (best man), Alison Griggs, sister of the bride (chief maid), Mrs Sue Henderson and Mrs Pamela Evans. Future home, Christchurch. (Lloyd Cornish). Bland–Wakelin. 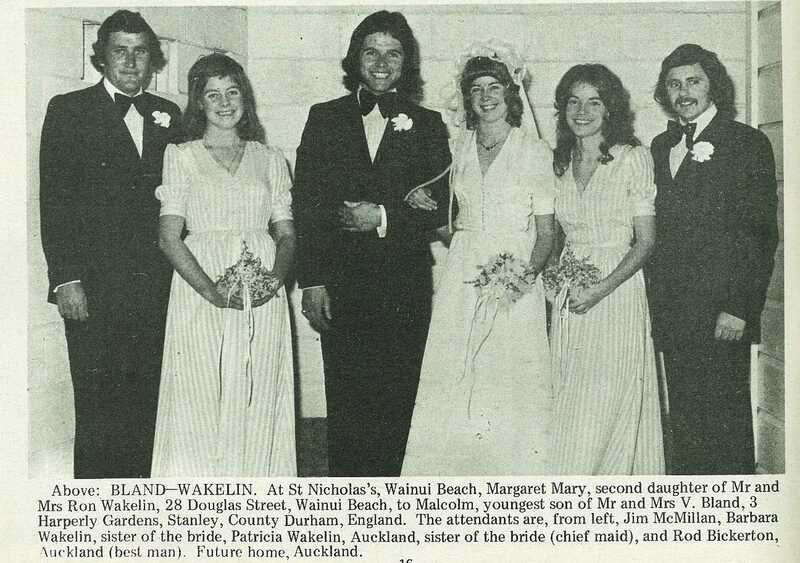 At St Nicholas's, Wainui Beach, Margaret Mary, second daughter of Mr and Mrs Ron Wakelin, 28 Douglas Street, Wainui Beach, to Malcolm, youngest son of Mr and Mrs V. Bland, 3 Harperly Gardens, Stanley, County Durham, England. 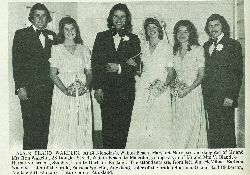 The attendants are, from left, Jim McMillan, Barbara Wakelin, sister of the bride, Patricia Wakelin, Auckland, sister of the bride (chief maid), and Rod Bickerton, Auckland (best man). Future home, Auckland.